The quality of your drywall installation services depends on a broad range of factors, all of which need to be done in a professional manner to ensure the best aesthetics and performance. Many people know the value and versatility of gypsum boards, but some are not sure as to how these pieces fit together to create a smooth, seamless surface. If you’re looking for a commercial drywall company in Illinois to create amazing outcomes for your renovation, addition, or new structure, our local drywall company is here to help! AZ Drywall Finishing has proudly provided comprehensive services to the Windy City for years. Our drywall contractors in Chicago have the tools and expertise to get your project done on time and on budget! Our team is dedicated to installing drywall at the highest level. Today, we’ll explain one component that confuses many people: joint compounds. Learn more about this versatile material here, then be sure to call AZ Drywall Finishing to receive an estimate for your commercial drywall services! Wallboards cover large areas in a short amount of time, but what about all of the gaps and joints in between each piece? Industry professionals and DIYers alike rely on a range of joint compounds to assist in creating perfectly smooth surfaces throughout the building. Failing to properly mud and sand your new drywall can result in unappealing results that can ruin the entire outcome. Pre-mixed options rely on airflow for drying, giving installers more time to get the job done right. This mixture is known to be less sturdy, but it can yield better results through sanding. Listed below are a few types of joint compounds that each provide differing characteristics to meet your residential or commercial needs. This midland product is designed to work in nearly any application. All-purpose joint compounds deliver convenience and versatility throughout your project, saving time and energy in the process. These benefits are great for DIYers, but keep in mind that an increase in functionality results in a decrease in quality for specific applications. You can achieve results, but you may not be happy with the quality. Drywall contractors will often rely on this mixture for texturing services. Convenience doesn’t always have to come with setbacks. Lightweight joint compounds are less dense than other options, making this material ideal for those looking to cut the extra weight. Many people utilize lightweight compounds because they are often much easier to sand and finish. This can be ideal for drywall contractors worried that their sanders will not be able to cover the area in time. Otherwise, you may be left with a big project that was avoidable to begin with. Be sure to do your research if investing in lightweight products, as some options may sacrifice adhesion to lighten the load! 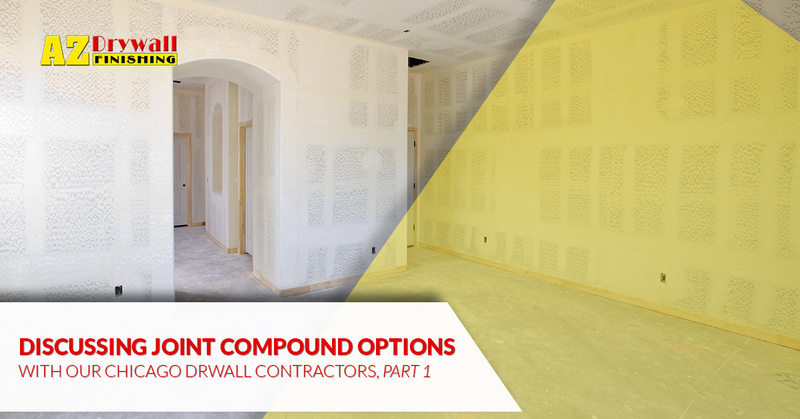 While seeking out a joint compound specifically for taping may not sound like a common option, contractors that struggle with temperature or humidity issues can achieve better results when investing in a specialized product. The surface layer of your joint will be the most crucial point for obtaining a seamless finish. This compound relies on fewer adhesives and delivers better workability, faster drying times, and amazing finishes after sanding. You can benefit from the convenience of an ultra-white compound that can easily be processed for finishing, texturing, and so on. Drywall installation relies on a diverse range of tools and products to deliver the best outcomes for today’s consumers. Next time, we’ll continue this series by highlighting joint compounds that rely on chemical reactions for drying as opposed to air flow. If you’re in need of professional drywall contractors in Chicago to deliver long-lasting and cost-effective results, the team at AZ Drywall Finishing is here to help! Our commercial drywall company specializes in providing comprehensive services for Illinois businesses, including metal stud framing, insulation, wall finishing, and more. Contact us today to learn about our commercial drywall services!